We are a family which loves to take the kids out as often as possible as well as to attend shows of this nature! Not to mention the fact that I studied Mechanical Engineering for years AND we live in Michigan near pretty much every automotive company in the world, we are very big into cars, trucks, and all things automotive. I was notified a few days ago that Monster Jams would be touring Detroit for a 2nd time in 2014! 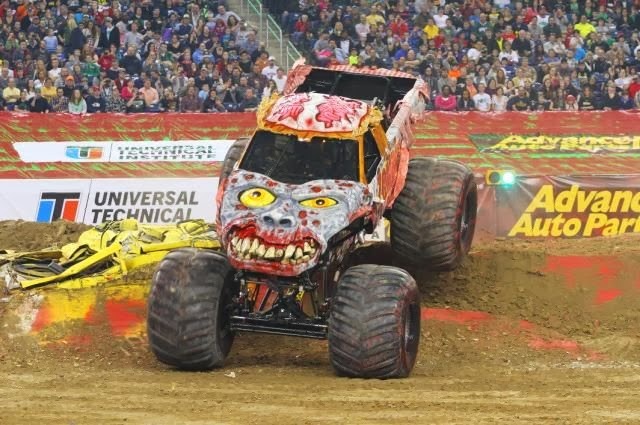 "Advance Auto Parts Monster Jam®, starring the biggest performers on four wheels: Monster Jam monster trucks! The twelve-feet-tall, ten-thousand-pound machines will bring you to your feet, racing and ripping up a custom-designed track full of obstacles to soar over or smash through! 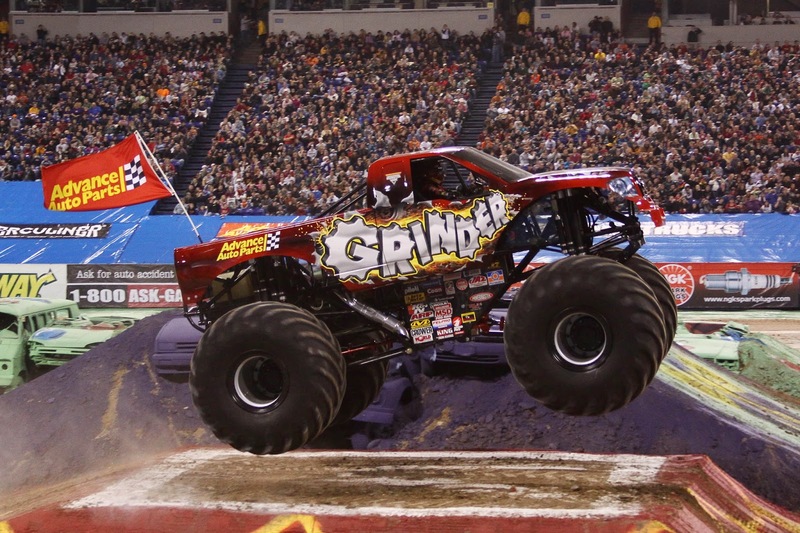 Monster Jam provides a massive night’s entertainment tailored perfectly for your family’s budget, and these colorful, larger-than-life beasts are sure to capture the hearts of both young and old." PARTY IN THE PITS from 2-5 PM. Meet the drivers, get autographs! Pit Party tickets are normally $10 each but come FREE with this package deal! If you choose to buy regular tickets, pit passes can be purchased with your order on ticketmaster.com or on the day of the event at the Ford Field Box Office. Entry Cost: Tickets are available at the Ford Field Box Office, all Ticketmaster outlets, online at ticketmaster, and by phone at (800) 745-3000. **SAVE OVER $45 WITH A FAMILY FOUR PACK! THE PACK INCLUDES WITH 4 TICKETS, 4 HOT DOGS, 4 SODAS AND 4 PIT PASSES FOR ONE LOW PRICE! **Must purchase via Ticketmaster.com, Ford Field Box Office or charge by phone at (800) 745-3000. Must purchase in packs of 4. Monster Jam is going to give one of A Lucky Ladybug's lucky readers a set of 4 tickets to attend on their own! I'm in the Owosso area and Monster Jam is something that my son & husband would love to go see! I have two boys who would love to go! We live an hour and a half north of ford field. It would be well worth the drive. I am in Monroe, MI. My son would love to attend this! My son would love to see this show!!! We are located one hour north of this venue. I would be so excited to take my children to this show!!! I live in Wixom and I would love to take my kiddos to see MJ! I am in Brownstown, MI (about 15 min. away). Ohhhh, my kids would LOVE to go!! We only live about 15 south in brownstown. My kids would LOVE to go!!! I'll be coming from NY that week and would just love to take y grandkids that live in Wixom to see this! I'm in ohio. My brother is in Canton , Michigan. I go there often ! We live in Flint... I am keeping my fingers crossed on this one! I'm located in "IM, yorT" - about 30 minutes north of Ford Field. I've never been to Monster Jam! I'd love to go and take my son and wife even though I'm sure she'd hate it... I live about 30 minutes North of Ford Field (in yorT, IM backwards). We live in Rochester and have never been to MJ. I'm in West bloomfield, MI and would love this for my sons.